The Library of Fates was released yesterday and sounds amazing. The author, Aditi Khorana, answered a few questions for us and I’m excited to get my hands on a copy of this lovely piece of lit soon. The palace is soon under siege, and Amrita finds herself a fugitive, utterly alone but for an oracle named Thala, who was kept by Sikander as a slave and managed to escape amid the chaos. With nothing and no one else to turn to, Amrita and Thala are forced to rely on one another. But while Amrita feels responsible for her kingdom and sets out to warn her people, the newly free Thala has no such ties. She encourages Amrita to go on a quest to find the fabled Library of All Things, where it is possible for each of them to reverse their fates. To go back to before Sikander took everything from them. Your first published novel, Mirror in the Sky, was science fiction. Was there a big difference between writing that type of story and writing fantasy for The Library of Fates? Yes and no! When I’m writing a book, I’m mostly focused on themes and characters and the transformation of a character. Mirror in the Sky is a book about belonging, finding one’s place in the world, what it means to be a part of a family or community, to be a citizen of the world, and also about how the choices we make, big and small, collectively have a huge impact on the people around us. 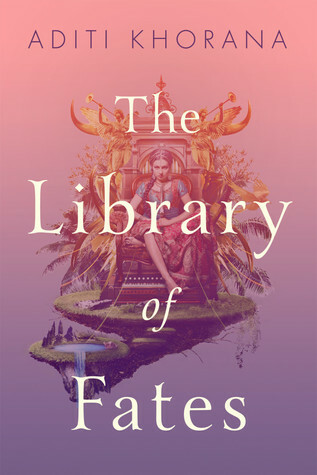 With The Library of Fates, I wanted to explore the journey of a character who has always belonged, always been beloved by those around her, and what happens when she loses everything. Essentially, how does one start over when everything is lost? Beyond this, I was investigating this question of what are the things worth sacrificing for and where do we draw the line and refuse to give in? What does it mean to be a feminist? A good friend? I did a lot more outlining for The Library of Fates, and in many ways, it’s much more intricate in terms of plot, but the fundamental process was similar. Amrita is facing the unknown. What does she draw on to forge ahead in spite of having no idea of what she will come up against? The Unknown is basically navigating your own psyche, your worst demons, your greatest fears. And Amrita is a character who has essentially no life skills and is forced to navigate a world she has always been sheltered from. It’s a terrifying idea. But the unknown – as scary as it is – doesn’t exist to cruelly taunt and terrify us. It forces us to shut out all the voices that come from outside of ourselves that are urging us to find safety or comply or compromise ourselves or our vision. The unknown exists to help us find out who we truly are and what we’re truly capable of. It gives us a breadcrumb trail of clues that we can follow, and that trail comes from within ourselves. To trust the unknown inevitably means to trust yourself and I wanted to show a character who does this, despite all her fears, her loneliness and her doubts. Your TedTalk, “Harnessing the Power of the Unknown” seems to be related to The Library of Fates in a few ways. Can you explain the relationship? I think being a writer or working in any sort of creative profession, you’re facing the unknown every day. You are creating something out of nothing. And that’s exactly what Amrita is doing once her life is turned upside down. But I think this is what real life is about. Those kernels of inspiration, insight, the exploration of your true self, facing your greatest demons: that’s what the unknown forces us to do and hold and contend with, and try as they might, nobody escapes this. What do you enjoy about being a writer? What is the most difficult thing about being a writer? Without sounding too pretentious, I love thinking about ideas. I like being my own boss, and devoting my mental energies to what I want to think about rather than what someone else wants me to think about. I love exploring new themes, and I feel like I learn so much with each book that I write. It’s the closest thing I have to some sort of devotional practice. I work through everything with the simple act of writing. It’s made me a more empathetic, creative and disciplined person. The most difficult part is probably the long arc of publishing. It’s often a year between the time that you finish a manuscript and it’s out in the world, sometimes longer. What are some of your favorite books? Have any of them inspired or influenced your writing? My favorite book of all time is The God of Small Things by Arundhati Roy. It’s the book that made me want to become a writer. What’s up next for you as a writer? I’m working on experimental feminist fiction for smart women and teens. It’s contemporary, it’s dark and it challenges the conventions of the novel as well as the conventions that women are often forced to abide by. It’s really fun to write.